The worst man in the world—and other despots, like Robert Mugabe—will finally face justice, now that the U.N. Security Council has referred the Libyan crisis to the International Criminal Court. It's about time, argues former top U.N. jurist Geoffrey Robertson. The worst man in the world—and other despots, like Robert Mugabe—will finally face justice, now that the U.N. Security Council has referred the Libyan crisis to the International Criminal Court. It’s about time, argues former top U.N. jurist Geoffrey Robertson. Plus, full coverage of Libya. International criminal justice has come of age. United Nations Resolution 1970, whereby the Security Council referred the Libya crisis to the International Criminal Court, finally delivers on the promise of Nuremberg that political and military leaders who mass-murder their own people will face justice on earth and not in heaven, from judges rather than historians. Muammar Gaddafi is the worst man left in the world, the prime example of “impunity”—that legal defect which allows criminals who are heads of state to live happily after their crimes. The council’s decision to end that impunity sets a legal precedent with some important consequences. For a start, it was the first unanimous vote of confidence in the ICC. Since it was established in 2002, this body has suffered the puerile hostility of the Bush regime (including the Jesse Helms-inspired “bomb The Hague” bill, which authorizes the president to use force to secure the release of any American in ICC custody). It has endured defiance, over its indictment of Sudanese leader Omar al-Bashir, from the African Union (particularly during Gaddafi’s presidency), which has petulantly and falsely claimed that the court is biased against African leaders. But the Security Council now has 114 members—not Libya, of course, nor any other Arab country except Jordan and Djibouti (a situation that the new governments in Egypt and Tunisia must change)—and has decided to act under Chapter 7 of its authority to take steps to secure international peace. In 2005, it referred the situation in Darfur to the ICC, but then the court’s opponents—Russia, China and, foolishly, the U.S.—abstained. By joining in Resolution 1970, they now acknowledge the right of “righteous intervention” to stop or punish the commission of crimes against humanity. This will have consequences for others— Robert Mugabe, to take just one example. His misdeeds have so far fallen short of international crimes (other than his massacres in Matabeleland in the 1980s—outside the post-2002 jurisdiction of the ICC). But the Security Council, by “referring the situation in Libya” to the ICC prosecutor, does not limit the court’s targets to the Gaddafis and their acolytes. Mugabe is reported to have dispatched troops and assistance to Gaddafi over the past few days. If true, this would make him an indictable accomplice to the continuing state killings. Saif al-Islam Gaddafi, too, is a candidate for The Hague—his mask as Libya’s “human face” slipped with his vicious broadcast vowing to kill his people “to the last bullet.” It was plainly an incitement to the army to commit war crimes. The evidence is overwhelming—it can be seen on television—and the prosecutor should bring down indictments in record time. Under Article 7 of the ICC statute, any widespread lethal attack directed against the civilian population amounts to a crime against humanity, and the willful killing of civilians in a civil war amounts additionally to a war crime under Article 8. Anti-Gaddafi diplomats have been wrong to allege that the attacks amount to genocide, since this crime does not apply in the case of armed killings of political groups. If Gaddafi retains power in Libya, then woe betide those who have fought his rule. There will be the threat of mass executions—hangings of dissidents from lamp posts were a feature of his early years. Once Gaddafi is indicted, an amnesty will not be possible for him—international law denies it to political and military leaders who bear serious responsibility for crimes against humanity. Any country that gives him refuge must be made to disgorge him, or else pay the severest price in sanctions. Mugabe, his closest ally, might be charged with harboring an indicted fugitive. If the colonel regains power but is nonetheless indicted, his diplomatic status will never again permit him to strut the world and demean it by rants at the U.N. General Assembly: Indictment by an international criminal court is the Achilles heel of traveling dictators, because it deprives them of the immunity they continue to have against prosecution in the courts of other countries. The previous weakness of international justice has been exemplified for many years by the Gaddafi case. There was no suggestion that he should be prosecuted for his assassination campaign against his enemies abroad, which claimed many victims, or for funding and promoting terrorism, or even for Lockerbie, a bombing that he obviously ordered, because it was carried out by Libyan intelligence officers who would not have acted without his approval. (If convicted bomber Abdelbasset al-Megrahi was as guilty as sin, then Gaddafi was as guilty as hell.) In 2003, Gaddafi came closest to legal nemesis when he actually was listed as an “unindicted co-conspirator” in the charge against Charles Taylor and Foday Sankoh, who had both been trained in Libya, where they allegedly conspired with Gaddafi to foment civil war in Sierra Leone as a way of obtaining its diamonds. The war led to more than 100,000 deaths. Professor David Crane, the prosecutor at that time of the U.N. war crimes court in Sierra Leone, now says he did not charge Gaddafi for fear that a diplomatic storm would be directed at the court for embarrassing such a powerful head of state. I was president of this court at the time, and can say with certainty that its judges would not have flinched at approving an indictment of Gaddafi had the prosecutor presented us with the evidence against him. Crane’s reluctance to do so, for fear of the diplomatic fallout, shows just how threatening Gaddafi-in-power could be. If he retains that power in Libya, then woe betide those who have fought or even protested against his rule. There will be the threat of mass executions—hangings of dissidents from lamp posts were a feature of his early years. Now, in that event, his indictment will provide a spur to international intervention under the U.N.’s “responsibility to protect” principle. China and Russia, having voted for the ICC reference, will come under pressure to endorse the use of force—probably by NATO—to save civilians and prisoners of war from becoming the victims of his vengeance. Resolution 1970 is significant for confirming international jurisdiction over crimes committed in civil wars and internecine struggles, by rulers who kill their own people. Perhaps it is time for the Obama administration to have the courage of its convictions and join the 114 other nations that endorse the ICC. At least an application for associate membership would emphasize a new American commitment to global justice. The days of Machiavelli’s Prince, along with the Westphalian order that clothed him with impunity, are numbered. It may in due course be said of Gaddafi that his barbarous nature and conduct forced the international community to deliver at last on the promise of Nuremberg. 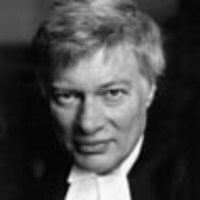 Geoffrey Robertson QC is a member of the U.N.'s Internal Justice Council and author of Crimes Against Humanity (The New Press).